The Fed may signal that it is near its "neutral rate" in its dot plot diagram, to be released in its meeting later. The U.S. 2-year Treasury yield has already lost about 50bps from its 2018 high. At 2.46%, it implies the rates market is pricing at most 1 rate hike by 2021. Long-dollar net positioning is near multi-week highs, and is showing signs of overcrowding. The Fed's dovish stance could inflict pain in an overcrowded trade. We are at a time in history where the words of central bankers hold sway on the overall risk sentiment in the markets. Mario Draghi's European Central Bank announced in March that the central bank would open up cheap loans to European banks and would take their time to normalise policy - keep in mind that their benchmark interest rate is in negative territory at 0.40%! The Euro Stoxx 50 (FEZ) responded positively to the ECB's guidance, with investors equating a longer period of lower interest rates to a more accommodative environment to invest. 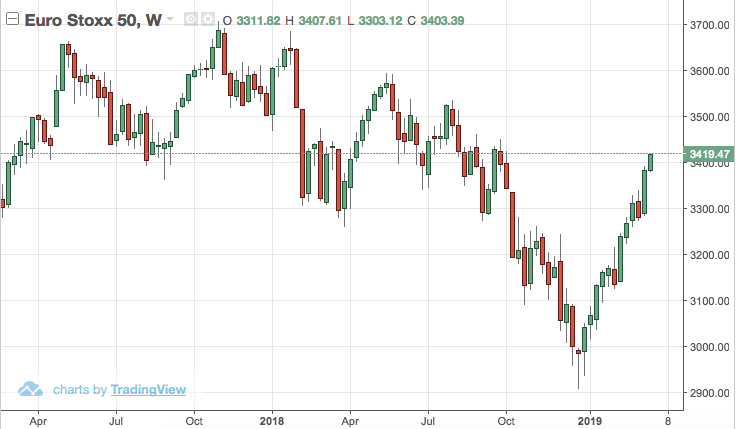 The equity index has since been on a roll, and is currently perched at the highs of 2019. Over to the U.S. Fed now, which is poised to meet today. The markets will be watching for the committee's tone after the central bank's rampaged on to 4 rate hikes last year. Since Q4 last year, the Fed has overseen a remarkable reversal in their tone. 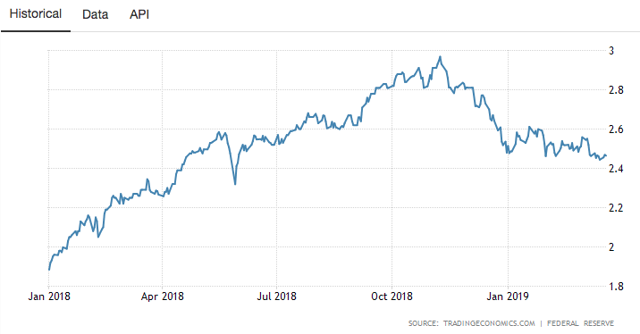 Jerome Powell and his committee have brought up concerns surrounding slowing global growth, economic headwinds, and uncertainty surrounding macro events (read: US-China trade relations and Brexit). In essence, they are communicating a change in interest rate course for 2019. Perhaps the sharp sell-off in equity markets in October last year inspired them to soften their approach. Trump has been a faithful critic of the Fed's aggressive rate hike trajectory, and perhaps ailing global growth has provided sufficient reason for the Fed to slow down without their actions being interpreted as a loss of independence. Regardless, their dot plot policy will be scrutinised by the markets today. The dot plot diagram basically shows the Fed's interest rate projections for the next few years - the diagram being an amalgamation of individual contributions by each committee member. If the diagram shows medium term interest rates or the "neutral rate" hovering near 2.25 - 2.50%, where the benchmark rate currently lies, then this clearly shows that the Fed is not willing to push for aggressive hikes down the road. In that case, we might not see more than 1 hike this year. Already, the U.S. 2-year Treasury has fallen from a high of close to 3% last year to 2.46% currently. This shows that the market is currently anticipating that the Fed's interest rate projections over the course of the next 2 years will be around 2.5%, which means that the market is pricing in not more than 1 hike till March 2021. For me, this shows signs that the USD might weaken against its counter-parties. 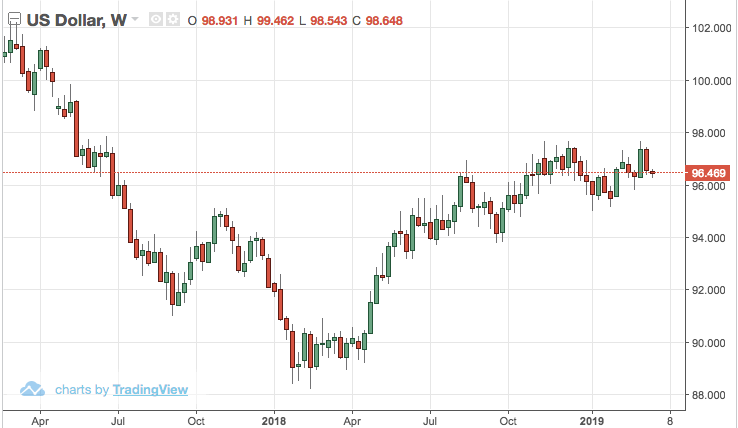 The Dollar Index (UUP) is currently still hovering near its 52-week highs, and to me that implies that the currency may not be reflecting the shifting expectations in the rates market yet. Or perhaps, the other major currencies have their own issues to deal with - the EUR trades softly due to Mario Draghi's dovish stance, Brexit hovers ominously over the GBP, Bank of Japan continues to pursue its ultra-loose monetary policy etc. Nevertheless, I feel a correction in the USD is due, and the Fed's dot plot diagram released later could serve as a catalyst to force some Dollar bulls to scatter. 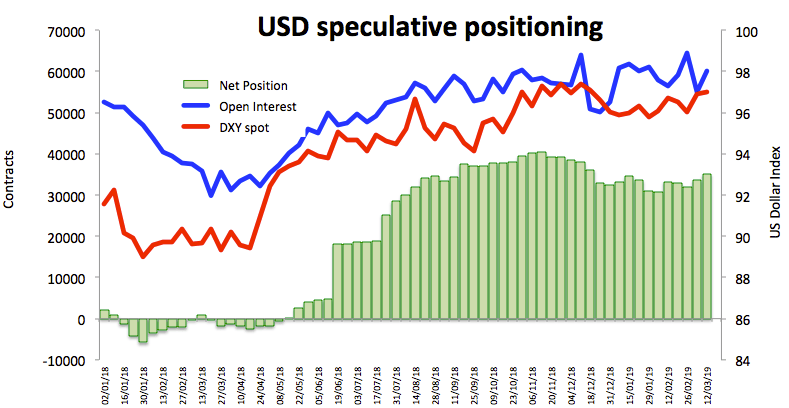 I want to share the below chart which shows USD net speculating positioning hovering near multi-week highs. This means the bullish USD trade may be showing signs of overcrowding, and may be susceptible to sudden shocks or squeezes. My advice is for investors to pare down on their long USD FX positions (back to their home currency for example). Investors may also consider taking a direct position to short the Dollar Index via the Invesco DB Dollar Bearish ETF (UDN). The Dollar Index currently trades near 96.50, and could weaken to test the 94.00 support - if that breaks, that could pave the way for it to test 90, which is near the 2018 lows.